Native Mediterranean tree, member of the Olive family, Oleraceae, and closely related to the Privets. The shrub has a rounded habit with densely packed branches covered with narrow 1 to 2 1/2 inch leaves, dark green and leathery, and producing small greenish white blooms in summer. Blooms are followed by tiny black berries which are loved by birds. Phillyrea is useful as a hedge, as it takes shearing very well, and is tolerant of maritime conditions, though it is not cold hardy. Phillyrea angustifolia is not particularly picky about soil types, but does best in a rich well drained soil in a sunny or partially shaded location. 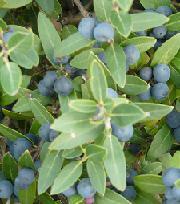 Phillyrea can be propagated by sowing seed, by taking softwood cuttings in the summer, or by layering. Seeds should be sown in a cold frame when ripe in the fall or saved seed may sown as follows: Scarify seed by nicking with a knife or file, then soak seed in warm water for 24 hours (or sulphuric acic for 30 minutes). Cold stratify seeds for 90 days, then sow seed in pots or trays. Transplant seedlings when they reach about 2 inches in height.